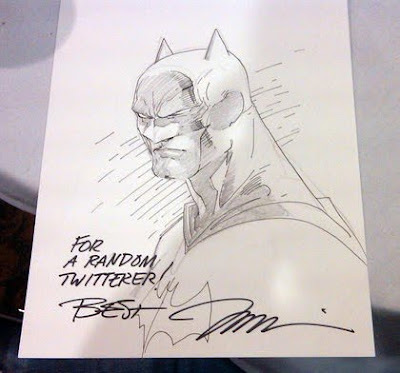 What lengths would you go to to get an original Jim Lee Batman sketch? Well fans of the superstar artist got to prove just that, when Lee tweeted a photo of random tables at this weekends Chicago Comics and Entertainment Expo, throwing down the challenge "Any peeps here at C2E2? I've done a sketch & am leaving it here somewhere for someone to find it :)"
The hidden sketch was found less than three hours later, under a tablecloth in one of the convention rest areas. While the winner is lucky no one decided to rest their coffee over the image while the hunt was on, Mr Lee gets the big thumbs up for using initiative, and coming up with a fun way to make the Con so interactive. Jim Lee promises more surprises for tomorrow, so if you are C2E2 bound be sure to visit jimlee00 on Twitter, to get the inside scoop! That's a cute idea, although I'm sure it led to some overturned boxes and chairs.